Yes it is quite expensive (around £7.99) compared to other products on the market, but I have always been happy to spend a little extra on my little one. He was such a sicky baby because he had Reflux that I didn't spend the pennies on his outfits! This is my favourite wash as it smells wonderful with a light scent of sweet orange, lemon and and coconut oil and leaves his hair smelling just gorgeous and his skin super soft. It is a 2 in 1 product so cleans the hair as well as the body. Many times I have got the product in his eyes as he is such a wriggler and not once has he cried because of it. This wash is not hugely lathering but if you rub it between your hands you can blow bubbles to entertain the little one and make them laugh. 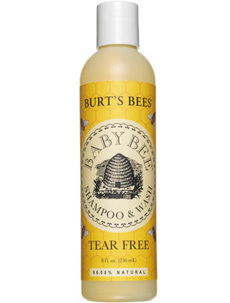 Burt's Bees Baby Bee Shampoo and Wash doesn't have any SLS or Parabens in it and is 98.03% natural - one of the main reasons I picked it up. I can highly recommended this product. Have you tried this ? What do you use on your little one(s)? 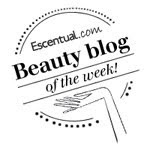 I recently tried Burt's Bees Bay Creme Skin Creme (on me) but didn't like it. The texture was strange, quite sticky and hard to spread... I don't even know how to explain it haha!